Part 3: What Jesus REALLY Means To Me. Born: July 17, 1959. Independence Hospital, Independence, Mo. Oldest of 5 kids born to Lee Coolidge and Janice Marie Wallenmeyer; my dad was a Pastor and Associational Missionary for The Southern Baptists. Have 3 brothers (David, Danny, Michael), the youngest my only sister Jana. Graduated From Christ Unlimited Bible Institute: 1981; attended 2 other Bible colleges, Hannibal-La Grange (77-79), Berean Bible Institute (76-83). Majored in Bible Doctrine. Minored in Bible History and Prophesy. The Heart Of My Testimony. Those were the FRUIT, so to speak, of my sinful life. The ROOT, the HEART, of my rebellion against God was due to us moving a LOT. Tired of being the new kid on the block. Tired of having to start all over. Tired of leaving my friends and never seeing them again. Tired of having to start all over and make new friends again. At an early age my resentment of moving then became a resentment of my parents, particularly my dad, and by extension a resentment of Church, Christianity, and then, finally, of God Himself. When I was 3 we moved from Independence, Mo. to Edina, Mo., and by age 5 to Memphis, Mo. . During this time my father was an Associational Missionary for The Southern Baptists and we were at different churches, different towns all the time. It seemed that the churches my dad worked with were troubled churches, mainly rampant hypocrisy and immorality, this, along with two other factors leads to the doctrine that I adhere to closely, that causes many, even Christians and other ministers, to become squeamish, more on that later. At age 9 we moved to Hannibal, Mo. where my dad took the pastorate at Antioch Baptist Church. THIS is where my already fomenting resentment fired up into hate-fueled rebellion. Antioch Baptist Church was rife with adultery, fornication, gossip, back-stabbing, lying, drunkenness, and rampant hypocrisy from the deacons, teachers, choir director…on down. My dad was a simple country preacher. He preached and taught God’s Word in simple black-and-white terms: Heaven was real, Hell was hot, Jesus IS THE ONLY means of Salvation (NO man, past, present, or future is needed, NONE can help do what ONLY Jesus can do), The Bible IS God’s Holy, Infallible, Immutable, Eternal Word, and Christians should pattern their lives after The Lord Jesus Christ…that did not set well with parishioners that wanted to hear comfortable, soothing messages and be left alone in their sin. The Icy Hill To Hell. In the winter of 1970 I was walking up a very slippery, icy hill in back of our house. I kept falling…and cursing a blue streak. After several attempts to get up that hill and falling I tried to “strike a deal” with God. I told God if HE would help me up the hill I’d serve HIM the rest of my life. I fell again. I had already been cursing, but what followed next was the blackest, vilest profanity on the blackest, vilest act of the blackest and vilest day of my life. I cursed God. I turned and focused all my pent up resentment, rage and hate directly at and on God. I cursed HIM with every ounce of hate and profanity I could muster. I told God that I hated HIM, hated Jesus, hated church, hated Christians, hated Christianity, hated my parents, and then told GOD to go to Hell…I never wanted anything to do with HIM ever again. I’m crying as I type this. God was and is sooooo merciful and gracious to me, to all of us…I was so eaten up with bitterness, resentment, and hate that I unleashed on the ONLY source of true, unconditional love, Agape love, that exists, God. From that point til age 17 I became daily hardened in my hate and rebellion. I got a Satanic Bible (Anton Lavey) and several other occultic books and became immersed in my hate-fired rebellion. We had moved to Needles, California in my 10th grade year. I hated it. Lost all my friends again. My parents said IF I saved up the money I could go back to Hannibal and visit my best friend, Mike Glascock, between my junior and senior year of HS. I arrived “back home” in early August of 1976. My best friend, who I thought was as big a doper and trouble-maker as me had given his heart to The Lord and Saviour Jesus Christ sometime in May at a Pentecostal tent Revival. He didn’t say “Boo” to me about it though. God knew I’d NOT go if I knew he had become a Christian. I hadn’t come almost 1,200 miles to go to no church! BUT GOD…. God had other plans. That night under the revival tent, a Baptist boy sat in the back row with his best friend. And The Holy Spirit really began to dig down deep into my heart, my soul, and my spirit. I was seeing and hearing things I never saw or heard before…genuine love, praise and worship for The Lord Jesus Christ. At about 10:00 to 10:30 pm, August 14th, 1976 the war between me and The Lord God ended with my unconditional surrender to HIM. And The Lord God flooded me with a peace I never imagined existed. I was now a Born-Again Christian. Besides getting side-tracked into a small, local movement/cult for about 14 months early in my Christian walk, which God graciously brought me out of and showed me the Truth on the matter, I have given myself to prayer and the prayerful study of God’s Word. By studying “The Original”, God’s Word, I am no longer swayed by every wind of doctrine. Now, NOT everything has been “peaches-n-cream” since I gave my heart to The Lord Jesus Christ…BUT my hard times are BETTER with The Lord than my so-called good times were WITHOUT The Lord! Because NOW whatever I face I face WITH HIM. Am I were I want to be in The Lord yet? Yes and no. Yes. I’m saved and growing in God’s grace and knowledge, II Peter 3:18. No, I still NEED to be more like Christ daily. Are you kidding?? No. But thank God, I serve a perfect, holy, righteous, loving, gracious, merciful, just, and FAITHFUL GOD! IF you skipped Part 3 to get down here to read “What controversial doctrine is the Rev. 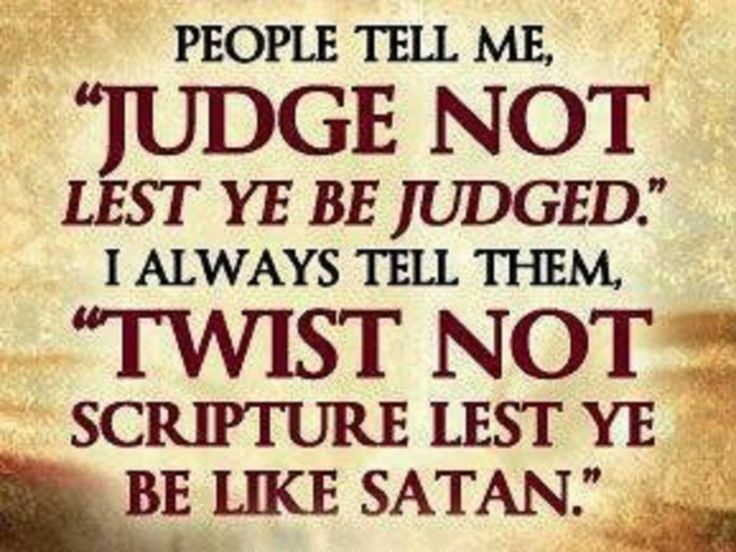 talking about?”, IF you did THAT then you will have a hard time understanding why I dug into The Bible to find out what GOD REALLY SAYS…about judging. Those still reading HERE is what The Bible REALLY teaches about judging, THEN we’ll look at the most often used, and most often misunderstood Scripture passage in The Bible. THIS has been a deliberated attack on God, God’s Word, and on God’s people going back at least to the 1950’s. I will post entire Scripture passages to show what GOD really says. Let us begin. BUT place that INTO the proper CONTEXT of the rest of the chapter, and indeed, The WHOLE BIBLE and you see Jesus Christ says in more detail in Matthew chpt. 7 what HE says in John 7:24. Jesus does NOT give a blanket prohibition of judging, BUT of superficial, hypocritical judging. ← Us vs. Them. Period. MAJOR UP-DATE!! !